i found this on pinterest and thought it was a cool idea! i feel most of us just pile our bags inside our closets (i do! ), but why hide them when they can be showcased on your wall! if you're the type that doesn't take care of your bags by stuffing them to keep its form...hanging them might be a great solution! this also is a great solution if you don't have a lot of closet space. if you like this idea you might want this bull's head, cows skull or gazelle head. i'm definitely buying one and when i do, i'm thinking of painting the horns gold to add some glam to it! hm...i think i just gave myself a DIY project for the weekend! 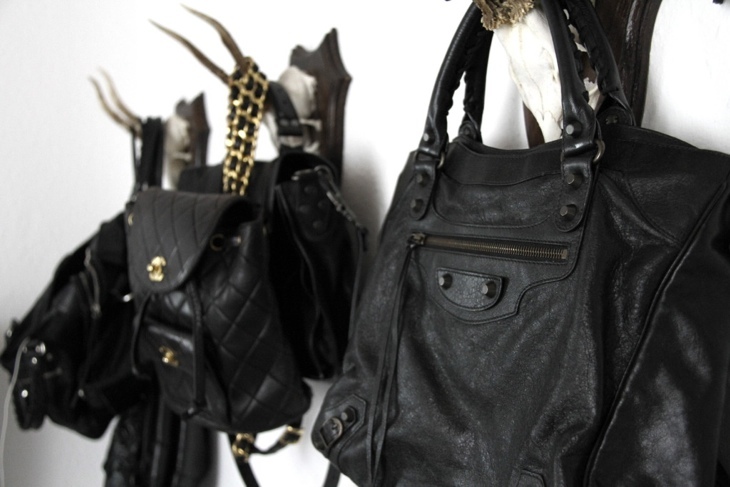 Can you even imagine having a bag collection like the one pictured above? I agree, it's such a fantastic way to display them. If you end up doing that diy, I would love to see photos.